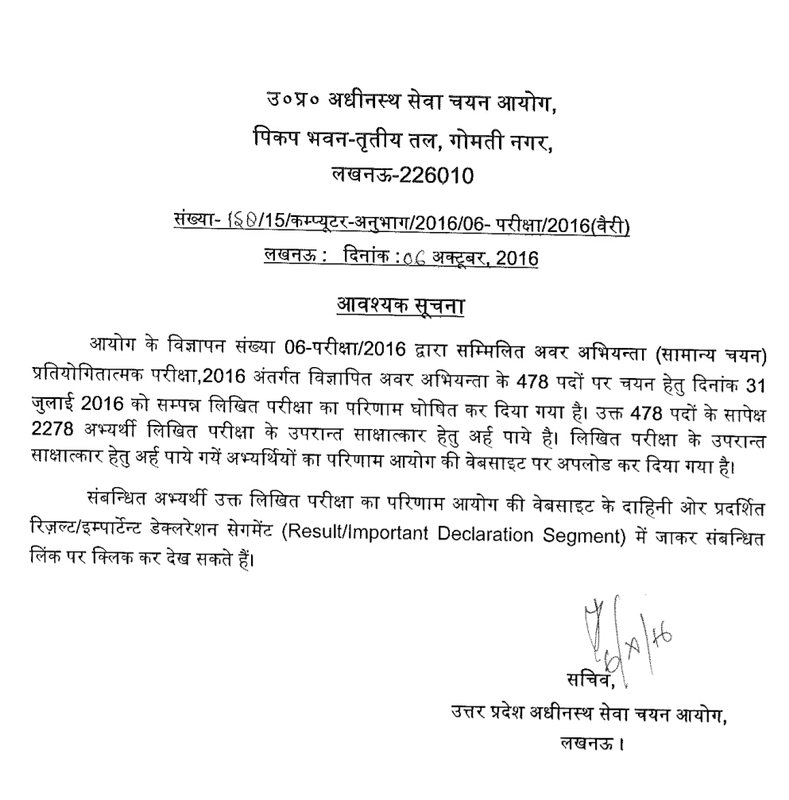 Uttar Pradesh Subordinate Services Selection Commission (UPSSSC) had organized Junior Engineer / Avar Abhiyanta written examination on 31 July 2016. The test was held in two sessions i.e. morning & evening session at 99 centres in Lucknow. Now the result of this exam is declared. Here you can check UPSSSC JE Exam result from below. Uttar Pradesh Subordinate Services Selection Commission had taken the written exam on 31 July 2016 (from 10:00 am to 12:30 pm and 02:30 pm to 04:30 pm) for Junior Engineer / Avar Abhiyanta posts. Answer key for this exam are available now for checking. The next step is the preparation and declaration of results based on final answer key. UP JE Results are available now at below link. You can know your UPSSSC JE results from this page as soon as they got declared. There are two papers of multiple choice objective type in the written test carrying a total of 750 marks. Questions will be asked from Hindi, General Knowledge, Computer Knowledge, Gen. Intelligence, English subjects. Those who qualify the written examination have to appear for interview which will be of 250 marks. The result of UPSSSC JE is available now at upsssc.gov.in website. A candidate will be able to know how much marks they can score after the declaration of results.